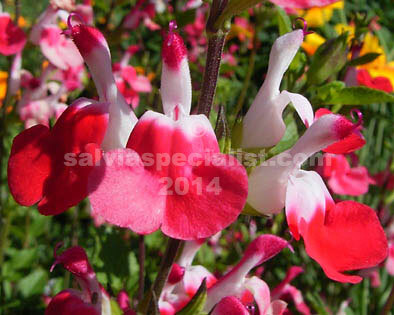 This salvia’s origin is clouded in hearsay, however it is a marvellous plant whose performance has induced many people to try other salvias. It has come from Mexico way and is similar looking to greggii/microphyllas. It is special because the flowers are very variable, either totally red, or white, or white with a red lip. There is generally a variety of colour blooms at the same time. Many people have theories about the cause but none seem to stand up in my experience so just enjoy its variety. It will flower practically year round and seems indestructible though it would rarely be a nuisance. It does need a shave or slash in summer when it will recover rapidly. It can get more than a metre high if allowed otherwise it is compact and an extremely useful plant. The leaves are very small so it could be hedged. It will keep on expanding sideways if you let it. A very good choice for a border hedge. It can be grown in sun or part shade in most areas of Australia and is hardy to frost and drought. In 2014 I started offering a sport, White Hot, which is pure white most of the year. When it is cooler there may be the odd red spot.